Intense Pulse Light, Medium depth chemical peels, fractional co2 resurfacing, skin care can improve back pigmentation. With Fraxel resurfacing the pigmentation could be at many different levels. More superficially, I would consider more aggressive skin care light lightening products (retinol, hydroquinone, hydrocortizone), 15% alpha and beta hydroxy lotion, at home glycolic peels. Also for superficial pigmentation, lighter chemical peels 10-25% TCA (Tricholoroacetic Acid) peels, and active / deep fx could help. For dermal pigmentation, active and deep fx could improve the pigmentation intense pulse light with varying filters could improve this, as well as different longer length lasers from 585-1064. Dermal depths are deeper and not accessible to most superficial treatments. Here is a video on intense pulse light. Areas of redness and scratches should heal after Active FX and co2 laser resurfacing. But Scarring should be determined by your doctor. Areas of redness and scratches should heal after Active FX and co2 laser resurfacing. This could be scratches that you did while you were sleeping but could also be from the laser resurfacing itself. I would continue your current cleaning regime. Six days after your procedure you should still be healing and with fractional co2 resurfacing, your skin should be totally healed over. If it were more traditional resurfacing your skin could still be healing over. The areas that are red will take some time to resolve. As some of the other authors have suggested sunscreen and sun avoidance are crucial during the first month and up to 6 months after the procedure. The redness will take some time to resolve but not as long if you had the traditional resurfacing. Some suggest steroids after your skin has healed over, but this could affect the healing and collagen production and most people would suggest against it. Intense Pulse Light or the v beam, or any laser that concentrates light in the 585nm range, your doctor should be able to determine what is best, can help with some of this redness by attacking the vessels that are causing the redness. Otherwise the healing will just take some time. One thing that could be important to determine is if there is significant swelling, redness and tenderness that could indicate scarring. This is something that your doctor should determine and in this situation, a high dose topical steroid could be needed to stem possible scarring. Posted in Intense Pulse Light, Laser Resurfacing, Scar Removal / scar reduction / scar revision / scar treatment | Comments Off on Areas of redness and scratches should heal after Active FX and co2 laser resurfacing. But Scarring should be determined by your doctor. Can chemical peels and photofacials be done every 2 weeks alternating? Yes you can do this but you need to be careful and not be too aggressive. Chemical peels that are combined with photofacials need to be light and superficial. It all depends on what condition you are trying to treat. If it is melasma, being to aggressive can sometimes aggravate the condition. This same principle also applies to hyperpigmentation. It also depends on your skin type too. If you have darker skin, being more cautious is important. chemical peels that are done every month should be more superficial. Deeper chemical peels require a longer interval otherwise scarring could occur. The benefit of doing chemical peels and photofacials together is that chemical peels work on more superficial elements of the skin while the photofacials can concentrate on deeper structures. The combination of the two however is rather in its infancy stage and there are not a lot of solid scientific evidence regarding using them. The research however will continue to find new ways to benefit our patients. Posted in Chemical Peels, Intense Pulse Light | Comments Off on Can chemical peels and photofacials be done every 2 weeks alternating? Scarring and whether Photofacials / Intense Pulse Light can help the appearance. More and more research is showing that scar production has a large contribution from the inflammatory component and that blood flow is a perpetuator. Intense pulse light and photofacials (or laser scar revision)can be used to target the blood flow to the scar and hence stiffle the blood flow that is feeding the scar production. Ultimately, this leads to less scarring and a better appearance to the scar. Timing is important, your scar should be in the inflammatory stage where blood flow plays an important part. If the scar is mature, the results will be less impactful. It really depends on how your scar looks. You may need a formal scar revision (or scar treatment / scar removal / cosmetic scar surgery / scar plastic surgery) with excision and a reclosure of the wound to improve it. Posted in Intense Pulse Light, Laser Resurfacing, Scar Removal / scar reduction / scar revision / scar treatment | Comments Off on Scarring and whether Photofacials / Intense Pulse Light can help the appearance. All of these options can help you maintain your skin without surgery. Fillers: when you age you lose volume and replacing this volume can do wonders to fill in the facial contours. This can get rid of general wrinkles and highlight the face in ways to bring youth to the face. Restylane, Juvederm, Perlane are hyaluronic acids and last from 6 months to a year or more. Radiesse is made out of bone and is very compatible and will last about a year. Artefiill is polymethametacrylate microspheres and is a permanent filler that is FDA approved for the nasolabial folds and can basically last permanently. Resurfacing: is a way to remove wrinkles, make pores smaller, take away unwanted pigmentation and tighten the skin. Chemical Peels, co2 laser resurfacing, dermabrasion, aggressive microdermabrasion, fractionated lasers can all do this to some degree. They can be tailored to fit your lifestyle and schedule. This is the only way to really improve the etched in wrinkles on the surface aspect while fillers can help do this from a deeper level. Fillers however will not change the surface charateristics as much as resurfacing modes can. Retin A: can reverse skin damage, decrease your chances of skin cancer, improve fine wrinkles, decrease unwanted pigmentation in mild to moderate degrees. This is a topical medication and is available through prescription only. Retin A can also help with Acne as well. It is also used to prepare the skin for laser resurfacing. Botox/Dysport: makes the muscles in your face weak whereever its injected. When the muscles are weak they can’t make wrinkles with the expressions. Botox can be injected in a directed manner to reduce the appearance of wrinkles! Skin care is vital. Your skin protects your face and allows it to look the way it does. When you wash your face with harsh chemicals or expose it to the environment in a extreme way it will react with redness and hyperpigmentation. Washing with a gentle cleanser and only once a day max will help. Tanning is a no no and you should always wear sunscreen and apply it all the time. Staying out of the sun is also important. What is Intense Pulse Light Treatment? Intense Pulse Light can treat sun spots, small veins, rosacea, and other forms of skin discoloration. This machine uses light to target your pigment and blood within your skin while sparing the other structures of the skin for less down time. You usually need 3-4 treatments to be fully effective often times but because of the essentially no downtime, this form of treatment is very popular. 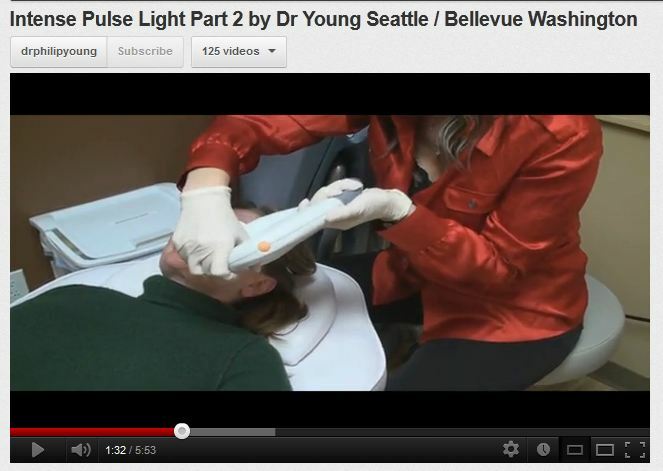 Intense Pulse Light can also be used to reduce unwanted hair as well. •	In other words, Intense Pulse Light can be used to treat red and dark spots that are at risk for cancer. • Current or history of cancer, especially malignant melanoma, or recurrent non-melanoma skin cancer, or pre-cancerous lesions such as multiple dysplastic nevi. • Disease which may be stimulated by light at 560nm to 1200nm, such as history of recurrent Herpes simplex, systemic lupus erythematosus, or porphyria. • Use of photosensitive medication and / or herbs that may cause sensitivity to 560-1200m light exposure such as isotretinoin, tetracycline, or St John’s Wort (Best Avoided for at least one year before your resurfacing). •	Immunosuppressive disease, including AIDS and HIV infection, or use of immunosuprressive medications. •	Patient history of Hormonal or endocrine disorders, such as polycystic ovary syndrome or diabetes, unless under control. •	History of bleeding coagulopathies, or use of anticoagulants. •	History of keloid or hypertrophic scarring. • Exposure to sun or artificial tanning during the 3-4 weeks prior to treatment. Sunblock should be applied 2 weeks or more before your procedure using a product that is sensitive for the skin and contains titanium dioxide or zinc oxide-containing sunblock. •	Ectropion, outward turning of the lower eyelid and excessively dry eyes, previous lower blepharoplasty. • koebnerizing diseases, prior radiation therapy leading to a loss of adnexal structures, extensive fibrosis resulting from prior cosmetic treatments (e.g., dermabrasion, deep chemical peels, silicone injections). Intense Pulse Light is not intended to substitute for a surgical facelift, ablative skin resurfacing, or procedures that treat deep wrinkles and saggin skin. It is inended for patients desiring eveness of color in their complexions, or those showing signs of sun damage and photoaging. Intense Pulse Light skin treatments have a great appeal to individuals with active lifestyles who cannot set aside healing time, as required with ablative procedures or surgery. The procedure requires not “downtime”, ie, patients can resume all activities immediately after treatment, except sun exposure. • Acceptable results will likely take a number of treatments, usually four to six. The entire program should be planned at the outset so that you can have a set schedule to come in and to help you to have realistic expectations. • There is a very small risk of adverse reactions such as changes in the testure and pigmentation of the skin. These are usually transient and rare. Discomfort: When a pulse is triggered, it may cause a various degrees of discomfort. Some describe the sensation as stinging, while others liken it to a rubber band snap. A burning sensation may last up to an hour after treatment. Change of Pigmentation: There may be a change of pigmentation in the treated area. Most cases of hypo- or hyper-pigmentation occur in people with darker skin, or when the treated area has been exposed to sunlight before or after treatment. In some patients, hyper-pigmentation occurs despite protection from the sun. This discoloration usually fades in three to six months, but in rare cases, mainly hypopigmentation, the change of pigment may last longer or be permanent. Scarring: There is a very small chance of scarring, such as enlarged hypertrophic scars. In very rare cases, abnormal, large, raised keloid scars may appear. To reduce the chance of scarring, it is important to carefully follow all post-treatment instructions and exclude patients that have a genetic tendency for scarring. Excessive Swelling: Immediately after treatment, especially around the nose and eyes the skin may swell temporarily. Swelling usually subsides within hours to as much as seven days. Fragile skin: The skin at or near the treatment site may become fragile. If this happens, avoid makeup and do not rub the area, as this might tear the skin. Bruising: Very rarely, a blue-purple bruise may appear on the treated area. It may last from five to fifteen days. As the bruise fades, there may be rust-brown discoloration of this skin, which fades in one to three months. Burns: There is a small chance of burns occurring on the skin. To reduce the possibility of burns from occurring, it is important to carefully follow all treatment instructions, and in particular performing test patches can be an option. General: cold packs should be applied immediately after treatment, to cool the treatment site, reduce swelling and ease discomfort. Chemical cold packs are not recommended, if their temperature is below 4 degrees celcius. Alternatively, frozen 4 x 4 gauze, previously moistened with water and inserted into small plastic bags or in plastic wrap, could be used after treatment.. In most cases, the low energy, low risk nature of IPL skin treatments make is safe to resume vitually all activities except excessive sun exposure. Exposure to Sunlight: Patients should use high factor (30-35spf) sunblock and protect the treated area from exposure to sunlight for at least one month following treatment. Tanning after treatment sessions may enhance melanin regeneration, which may result in hyper-pigmentation. Makeup: You can use makeup immediately but if there is any reaction you should notify us as soon as possible. Adverse effects: If there is any adverse effects, treatment should be discontinued until the treatment site has healed and the reason for the adverse reactions are understood. Determining when treatment should be concluded will be discussed with you and we will do everything to make sure that you are happy! Posted in Intense Pulse Light, Laser Resurfacing | Comments Off on What is Intense Pulse Light Treatment?